What is Supplier Quality Management (SQM)? "What is Supplier Quality Management (SQM)?" First, What is Supplier Quality Management (SQM)? Supplier Quality Management is a confidence in supplier's ability to deliver a good or service that will satisfy the customer's needs. Supplier quality management and performance monitoring are key components of any risk management strategy.Performing risk assessments to identify, quantify and prioritizing risk is the most important factor. What are the methods to improve supplier quality, increase visibility and connect the supply chain to your Quality Management System? What are the benefits of connecting the supply chain to your Supplier Quality Management System? How to alleviate security concerns associated with it? How can you bring greater visibility into the supplier quality and compliance by implementing a Supplier Quality Management System? How to evaluate Suppliers through Supplier Quality Management Programs? 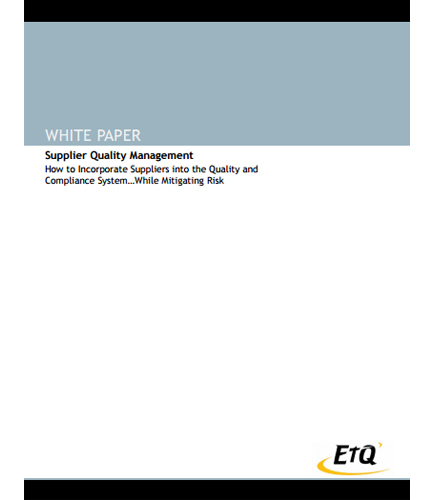 Download this whitepaper that gives an idea of a comprehensive Supplier Chain Quality Management that fosters the ability to collaborate with the supply chain, improve compliance and keep your data secure in the process.